Our clients are our partners. We are extremely selective and agree to take on only assignments on which we can deliver exceptional value. We align our interests with those of our clients by investing a substantial portion of our fees in equity, earn-out or hybrid vehicles. We’ve committed a substantial share of our capital to our client partner companies. 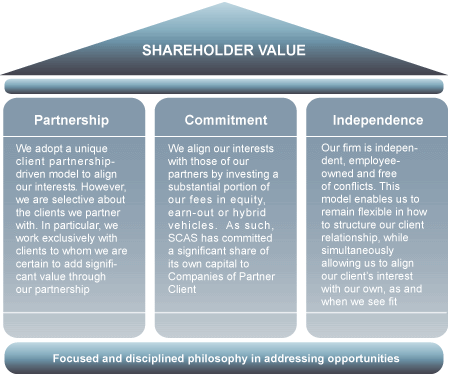 Our firm is independent, employee owned and free of conflicts of interest. This model enables us to serve clients singlemindedly and remain flexible in our engagement staffing.